The title of August Wilson’s “Fences” might sound like a dividing play, but Wednesday afternoon it united an auditorium full of people. Visiting anthropology professor Philip Kao’s Intro to Cultural Anthropology class hosted a two-day “Fences” excerpt reading, which drew about 70 students and non-students, as part of a larger, monthlong event commemorating Wilson’s most famous work. August Wilson, the influential black Pittsburgh playwright, penned 10 plays — most of which take place in Pittsburgh, and predominantly comment on the black American experience. The reading unfolded during the class’ Monday-Wednesday time slot, at 11 a.m. in the Frick Fine Arts Building in Room 125. Kao started the Wilson-themed event series to form a “community book project,” geared toward undergraduates. “A lot of colleges have, when you go to orientation, [an event where] everyone reads a book and it’s a conversation — it’s a community,” he said. The series began in February with history associate professor Laurence Glasco leading a biographical talk about Wilson’s life on Feb. 29, and will end Thursday, March 31, with a literary tour of the Hill District, Wilson’s home and frequent source of inspiration. English studies professor Christopher Rawson, who is also an August Wilson scholar and has recorded more on the playwright’s life than any other scholar, moderated the readings. Local semi-professional actors read selected excerpts from the text, serving as a kind of highlight reel of the play. “Fences” follows Troy Maxson, a former baseball player turned garbage man when he is unable to make good money swinging bats. As a result, Troy has trouble providing for his family as well as struggling with his role in life. His problems come down hard on his wife Rose and son Cory. 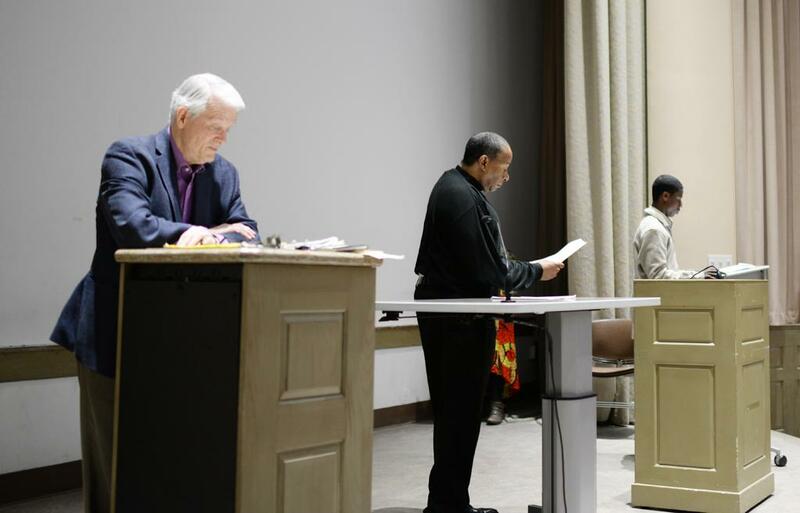 Local actors Kevin Brown (Troy Maxson), Vanessa German (Rose Maxson) and Wali Jamal (Bono, Troy’s best friend) lent their voices during Monday’s reading. Both Brown and German reprised their roles Wednesday, with actor Sundiata Rice joining them as Troy’s son from a previous marriage, Cory Maxson. Caroline Stilley, an undeclared first-year, doesn’t usually enjoy plays, but she took something meaningful from the reading. Rice won last year’s August Wilson Monologue Competition — a national contest in which high schoolers recite a monologue from any of Wilson’s plays. The Pittsburgh Creative and Performing Arts School sophomore said he’s drawn to “Fences” because he resonates with the characters. Wilson wrote the play in 1983 — 18 years before his death at 60 years old — of sudden fatal liver cancer. Critics generally consider “Fences” Wilson’s best work, but others might disagree. For Brown, the play’s everyday, blue-collar protagonist and familial themes make it timelessly relatable. “Fences” has seen a handful of formal productions, from Pittsburgh to New York. Most recently, Denzel Washington sealed a deal with HBO to produce and adapt every play in Wilson’s Pittsburgh Cycle — a series of 10 plays that each span a different decade in the 20th century. Washington will act alongside Viola Davis in an upcoming film adaptation of “Fences,” which will shoot in Pittsburgh, reprising their roles from the play’s 2010 Broadway revival. Rawson said the bulk of Wilson’s plays concerned groups of characters, with storylines eventually shining through and connecting to each other. “Fences” was a contrast, with a strong central character that focuses the play. “Theater critics tended to like that. They called it ‘the Black “Death of A Salesman,”’” he said. For Rawson, “Fences,” along with Wilson’s other works, displays the playwright’s understanding of not only black culture, but society in general.